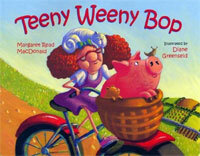 Rackety tale of the Teeny Weeny Bop’s excursions to town to buy a pet. Good hamster...but where can she keep him? Chant along home with her and find out! Hear MRM tell this tale on the CD Cockroach Party! https://www.youtube.com/watch?v=DKMOmGtZKx4 Filmed in Hawaii, May, 2016 by Jeff Gere.